Transportation Nag: How far is it? After spending a month getting around by wheelchair a year ago, I'm much more aware of how the physical environment influences my ability to move around and explore my surroundings. In my usual healthy state, I can almost always combine walking, biking and public transit to travel wherever I want to go in my city. But even then, my choices of where to go are influenced by environmental factors. For example, there are five public libraries within 2 miles of my house. I usually prefer to travel by bike. The easiest library to reach is not the closest; I choose the low traffic and "mostly flat" route to the Douglass Truth Library most of the time. Traveling by wheelchair and public transit last year, Douglass-Truth and Capitol Hill were a close tie. I could reach either library without either transferring to a second bus or negotiating a dauntingly steep hill. Douglass-Truth requires a longer, more circuitous bus ride; Capitol Hill means a longer roll along the sidewalk. Walking, I usually prefer the Capitol Hill Branch. Getting there requires climbing a steep hill - both ways! - but there are interesting destinations along the way, including grocery stores, restaurants, and lots of elegant old houses with colorful yards. 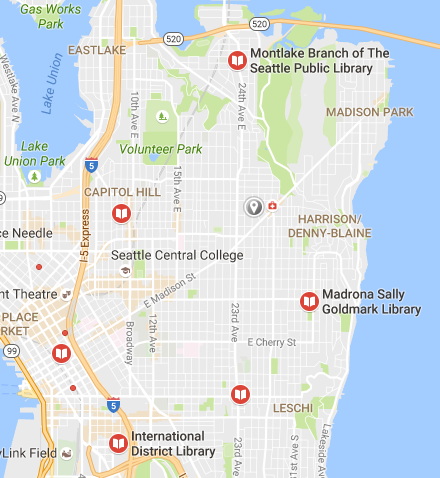 Even though Madrona/Sally Goldmark is the same distance away, the route there doesn't include other destinations so it "feels" much farther. The Central Library has amenities that the other libraries lack - I love the Seattle Room on the tenth floor! - but getting there is much more challenging than the 2-mile distance would suggest. It requires a transfer to get there by bus, and the bus stops are on steep hills making wheelchair access daunting. Hills, traffic, and inadequate bike lanes discourage bike access. So I only rarely visit this Seattle treasure. 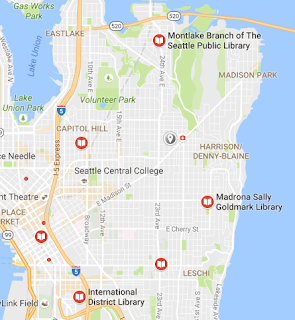 Distance is only a minor factor in determining "how far away" these five libraries are from my home. Hills, traffic, interesting surroundings and bike infrastructure count for much more. Move More - But Don't Stop Driving! Transportation - it's how we get around. Walking, riding bikes, taking the Light Rail or the bus or the ferry. Sometimes, even, when there's really no alternative - driving a car.